When I about 16 years old I started playing around with vintage hairstyles. I would watch old movies and scour my local vintage shop for old magazines and study their intricate hairstyles. I started to understand and admire the esthetic and shape of the vintage styles and I wanted it!!! I eventually cut my bangs into “Bettie Bangs” and started twisting my hair and creating poodle hairstyles. I bought snoods and started making my own hair flowers. The only problem was, I naturally have incredibly curly and thick hair and the styles that I was in love with were all lovely waves or soft curls. And the idea of running a brush through my hair sent shivers down my spine. A brush though my crazy, curly locks typically resulted in a huge frizzy mane that even Mufasa would be jealous of. Nowhere in the vintage magazines did it ever talk about how to style naturally curly hair. I just assumed that no one had curly hair back then. Then came the Internet. Once photo and video tutorials were commonplace and vintage blogs started popping up I once again turned to educate myself. Yet, I still couldn’t find anything specific to naturally curly hair. I found some great info on styling your hair when it’s curly, but nothing about how to achieve the coveted vintage styles by taming my natural curl. So I started to experiment. I learned from having Bettie Bangs that it was imperative to “relax” the curl in order to manipulate it and bend it to my will. So I started to experiment to see how I could temporarily relax my curl and create the soft waves I was so desperate for. I never wanted to use chemical relaxers and while I do use a straightening iron occasionally (mostly on my fringe), fully straightening my hair never worked to create the style I was after. If I straightened my hair it wouldn’t hold a curl for more than 30 minutes. My hope for this post is to provide some guidance to anyone who is struggling with vintage hairstyles and their naturally curly hair. There will be some general information as well, so If you don’t have naturally curly hair, some of this information might still be helpful for you. I’ll list some of my favorite products and tools here. I will create another post for my various wet sets and then I will start a few tutorials for my styles. Because my hair tends to be dry, I try not to use too many heat styling products. I wash and set my hair once a week. I can sometimes draw it out to 10 days, if I’ve not heavily styled it every day. WASH: I use Deva Care No-Poo Shampoo and One Condition Conditioner. This product is designed specifically for naturally curly hair and has no sulfates so the shampoo doesn’t foam. It’s considered a “co-wash” system, which means that the shampoo won’t strip your hair and it helps to retain maximum moisture . I don’t wash out the conditioner; I just use it as a leave-in. TOWEL: It took me a while to figure this one out….it is really important to have the right type of towel to dry curly hair. A microfiber towel is the best or you can use an old t-shirt and remember, never rub your hair dry as this will separate the curl and create frizz. I use a Turbie Twist Microfiber Hair Towel right out of the shower. I twist up all of my hair into this turban and secure it with the fastener in the back. I keep it in this towel for 30-60 minutes to really whisk away the water. SETTING LOTION: I’ve tried so many setting lotions and found that straightening balms tended to work better for me. However I was noticing that my scalp was getting dry and flaky so I was once again on the search for something new. 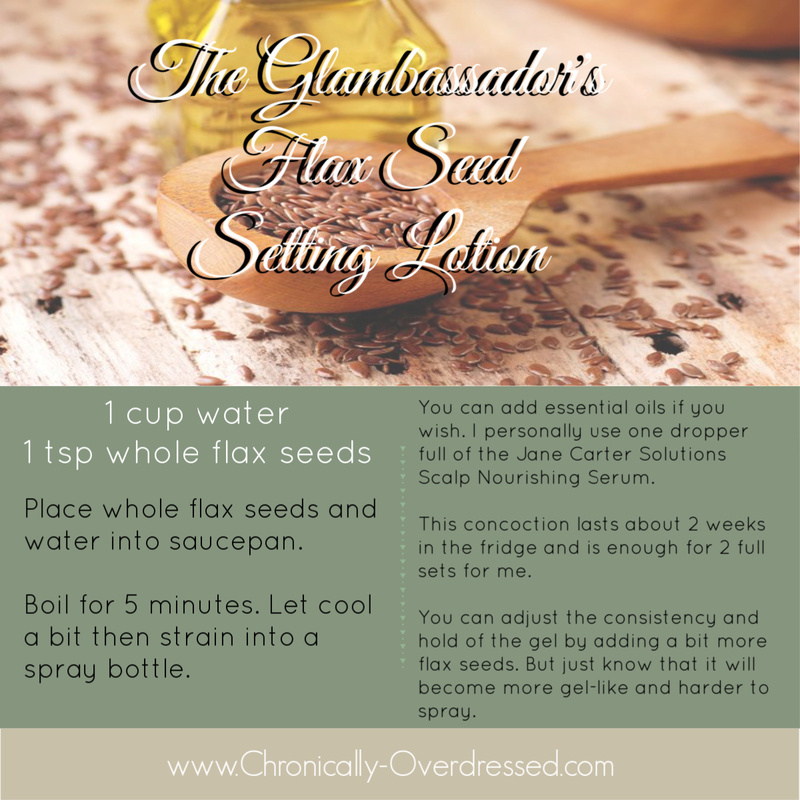 Over the last year or so I’ve been making my own flax seed setting lotion. It has done wonders for my hair. I have less flaking, it holds my sets really well and hair looks really shiny. See my recipe below. This recipe makes enough for me for 2 wet sets and will last 2 weeks in the fridge. I just spray it on each section of hair then I can start to roll my hair into my sponge rollers. I have a few patterns I use regularly depending on the desired outcome. I will do a separate post on my various sets, but you can see my regular wet set here. HAIR OIL: I cannot live with out Precious Oil Versatile Caring Oil from Pureology. This is truly a versatile oil, it adds shine and smooths flyaways. It also replenishes the protective lipid layer to enhance color vibrancy. This was very important to me when I colored my hair red, as red tends to fade quickly. But it works well even with my dark brown color now. 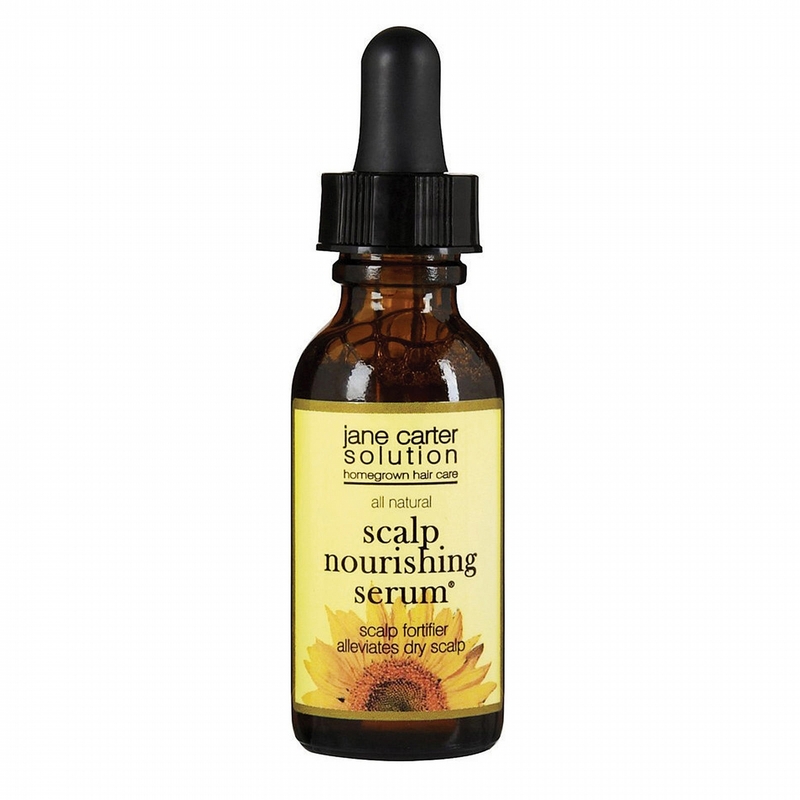 I use this oil after my hair has dried, before I style it. I use this oil just about every day to add shine and create smooth styles. HAIRCREAM: On vacation a few years ago, I forgot some of my styling products so I used my husband Brylcreem for a bit of hold and I fell in love. It’s a light creamy product that has a light hold, and give your hair shine. As my hair is dryer naturally, I can handle this kind of product. But I would imagine that if you have thin hair or if it tends toward oiliness, this would not be a good product for you. I use a very small amount and distribute it evenly through my hair. It does have a light “men’s hair product” smell, but I don’t mind it at all and it dissipates very quickly. HAIRSPRAY: I love Elnett Unscented Strong Hold. This is truly THE BEST hairspray for anyone who doesn’t wash their hair everyday. It’s not a super strong hold, but it’s great for most hairstyles, and the fact that it’s unscented in a bonus as I am very sensitive to smells. I never understood why hairspray should be scented anyway. But what makes it so amazing is that it really does “disappear with a stroke of a brush” as indicated on the bottle. Which means that it doesn’t create a ton of build up on your hair so I can style my hair for several days not feel like my hair is gross. POMADE: Pomade is essential to sculpt and hold vintage styles. I usually only use pomade when sculpting victory rolls or small pin curls. I don’t like to use it on all of my hair unless I’m doing a very sleek look. I have several tins of different pomades, and each one has it’s merits. I like the water based pomades as they don’t leave too much residue. But if used everyday it will buildup and look horrible. This is why I use the Precious Oil to smooth flyaways instead. The two I use the most are John Master’s Organic Hair Pomade and Layrite. BRUSHES: Another “can’t live without” item is my Denman brush. As I mentioned before, I never really used a brush on my curly hair and certainly never really cared what kind of brush I used. But when the Denman brush was highly recommended I thought I would try it. And it really changed my mind and my styling process. This brush really helps to sculpt my curls and waves, it’s comfortable in my hand and massages my scalp. I brush my hair each night before bed, otherwise it tangles. This also helps to brush out some of the product that I use and helps distribute some of the natural oils. I also have a boar bristle paddle brush, which I use for taming some flyaways and doing more sleek styles. COMBS: Two essentials are a wide-tooth comb and a rat-tail comb. The wide-tooth comb is perfect for combing the through wet hair and also combing out my set right after I take out my sponge rollers. For most naturally curly haired girls, the wide-tooth comb is the closest thing we get to a brush. The rat-tail comb is your basic comb for everything from parting your hair – for wet sets, side or middle part – to backcombing for extra volume. I also use this comb to straighten my hair as I wrap each strand around the sponge roller. CLIPS: Duck-bill clips and pin curl clips – used to help separate the hair, secure a pin curl or sculpt a wave. I also have a few wave clips, which can be helpful for creating a more defined finger wave. HAIR SIDE COMBS: I have several sizes of hair combs, and I prefer the brand Grip-Tuth. These keep your hair in place because the teeth touch each other, leaving no room for hair to slide out. I use these regularly to hold the sides of my hair up or back. These create a nice soft look. I use them when I do my “twist” hair styles (as pictured above) as they really grip and hold your hair in place. RAT ROLL: I will have to dedicate an entire post to the infamous rat roll. I make my own rat roll with hair that I collect from my hairbrush. I keep the hair in my beautiful hair receiver that sits on my vanity. I do have a few synthetic rolls that I use for a larger back roll. But I prefer to make/use my own. HAIR PINS: Of course every woman’s vintage hair routine would not be complete without bobby pins. I use two different sizes – medium and small – and I make sure that they are never seen. It’s a big no-no to have your bobby pins showing. It does take some practice to learn where to place the bobby pin and hide it, but it can, and should be done. The medium size pins are great for just about everything, but the small pins I reserve for small pin curls or any curl or wave around my face. They are much easier to conceal. I also use traditional hair pins to secure rat rolls and french twists. They aren’t tight like a bobby pin but they do hold larger amounts of hair pretty well. Well, I think that’s about all my main products and tools. I hope this was helpful for you. And just remember that practice really does make perfect. My best advise is to really get to know your hair, and learn what it’s strengths and weakness are. Be kind to yourself when learning, and most of all, have fun with your styles. I look forward to answering your questions. I’d also love to hear from you, which hairstyle you’d like to see a tutorial of. Fantastic post! Thanks for sharing your tips/tricks! Thank you very much for these informations! While you are living in Germany now: Do you buy these products online? Or can I get them here? Thanks a lot! I added a link for each product. It should come up in a slightly different color. I know you can get a lot of these items on Amazon.de. If you have problems finding anything, please let me know. OMG for someone who was born with pin straight hair and was not blessed with the ability of doing anything with it I am always super impressed with gifted women like you. Wow!!! What a detailed, fantastic post. Thank you for sharing your expertise in this hairstyling field with us, sweet gal. *PS* I think your natural curls are gorgeous. All my life I dreamed of curls like yours! I have straight but, incredibly thick hair that is difficult to work with so much of this was useful to me! I’m so happy this was helpful for you. Have you tried sponge rollers before? I find they create the best curls and waves for me. I know this is an older post, but I’m struggling! I’ve done pincurls before and sort of brushed them out but didn’t go all the way into vintage wave territory. My natural hair is very, very curly with lots of volume. And it’s long! Today I tried to brush out some sponge roller curls for about 45 minutes, and it went absolutely horrible. They were dry, but the brush out was huge and frizzy – mostly at the second half of my hair/the ends. I got so frustrated after trying for so long that I gave up. I’m wondering if you have tips for girls with lots of natural volume like me. I’m glad you found my post and I hope you found it helpful. I too have very curly and thick hair with lots of volume. I’m happy to answer your questions and hopefully get you on your way to a great wet set. But first I just need a little more info form you. Did you use a setting lotion? If so, what did you use? What size rollers did you use? Did you make sure your ends were tucked into the roller? This makes a hug difference. When brushing your hair out, did you use any product like a pomade or a smoothing cream? I look forward to hearing from you. I never saw that you replied until today when I was poking through my WordPress for some reason – I’m so sorry! The notification must have been hiding all this time. I guess I didn’t notice because I’m not a full-time retro/vintage-wearer, so I haven’t tried to do my hair in awhile. I usually limit myself to retro influences (mostly 40s) and incorporate them regularly – which I like because I also enjoy other styles – but sometimes you just want to go full on! Which is why I want to figure out this hair. If you’re still game to help: I hadn’t used any extra product (before/during rolling or during the brush out) besides my usual Redken Curl Definer because it worked the other times I did pin curls (but didn’t significantly brush them out – maybe it’s not strong enough for that). I used a kit of rollers that had varying sizes – probably another mistake. And I tried to ensure that the ends were tucked in! Thank you so much for this, I have naturally curly hair, and all I saw in youtube where tutorials where all have naturally straight hair and then proceed to make the curls, while for me that will take the idea of me straightening my hair to then make the curls again, and I don’t want to submit my hair to all that stress. 😀 Thanks again!